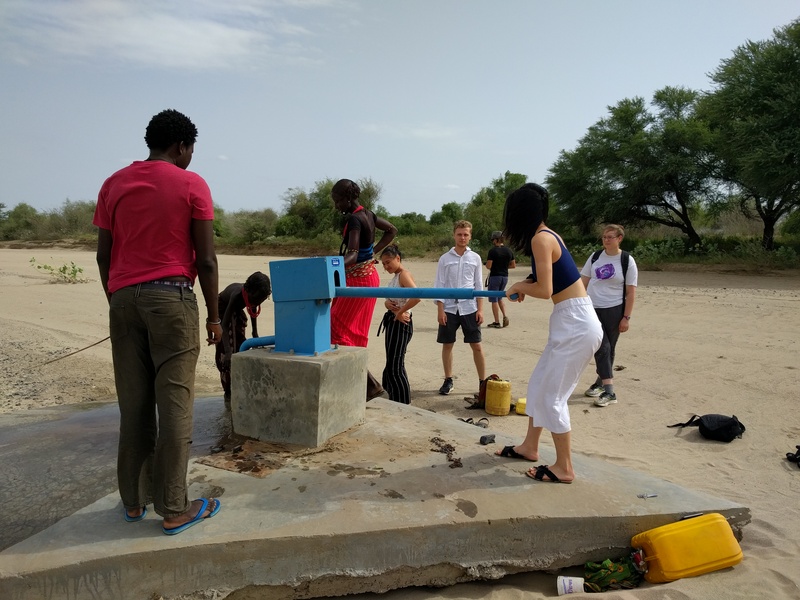 On Monday June 18th we took a trip to see one of the hand pumps that was installed by a non-governmental organization. When we arrived there was a woman and a few children pumping out water. 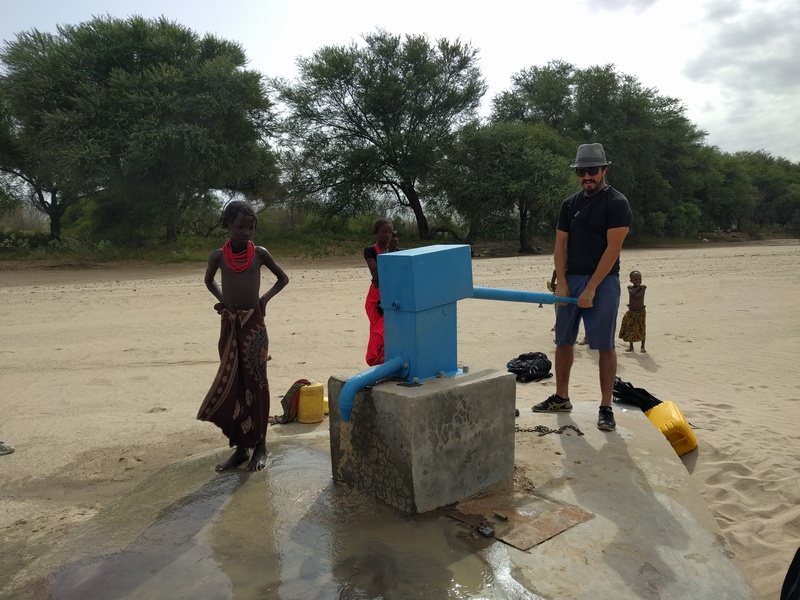 After speaking to them, with the help of our translator Habara, we discovered that the pump had not been used in a while so the woman was trying to pump until she got clean water. To help her all of us took turns pumping, leaving our arms very tired. Winnie Wang taking a turn at pumping water. Students Emily Aviles and Winnie Wang used this opportunity to test their biosand filter. In the past they had successes with filtering water from a different riverbed near the clinic. 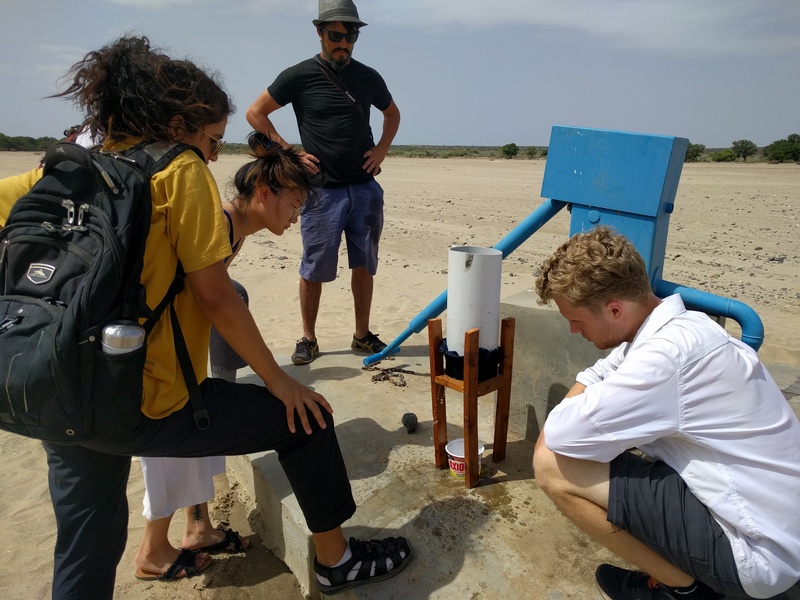 However, after a few liters of water from the hand pump went through their filter it became apparent that this water requires a different type of filter; the soil grain size in the water was too small for their filter to separate it out. Emily Aviles, Winnie Wang, Rodrigo Peña, and Sam van der Poel (from left to right) test Winnie and Emily’s filter. While at the same location, we assisted the TBI mobile clinic in distributing food. The Clinic keeps track of children who suffer from malnutrition, as well as pregnant women. Typically the clinic will weigh the child or woman and measure the circumference of their upper arm. These values are inputted into a book and used to determine an amount of food packs the child receives. The food packs have the consistency of a bar and it is filled with lots of sugar, oil and fat. We also passed out condensed cereal packs to pregnant women. 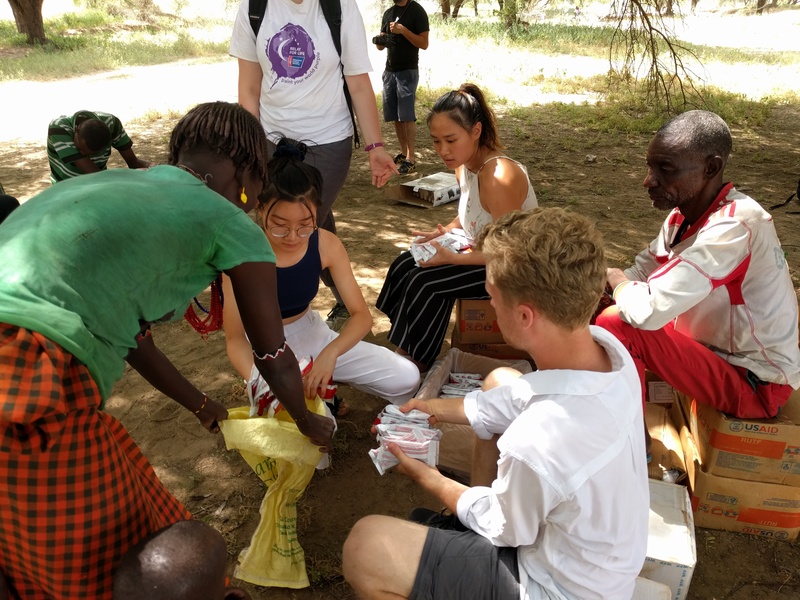 Winnie Wang, Natalie Lubaszka, Konnie Xu, and Sam van der Poel help with counting and distributing malnourishment packages for locals. 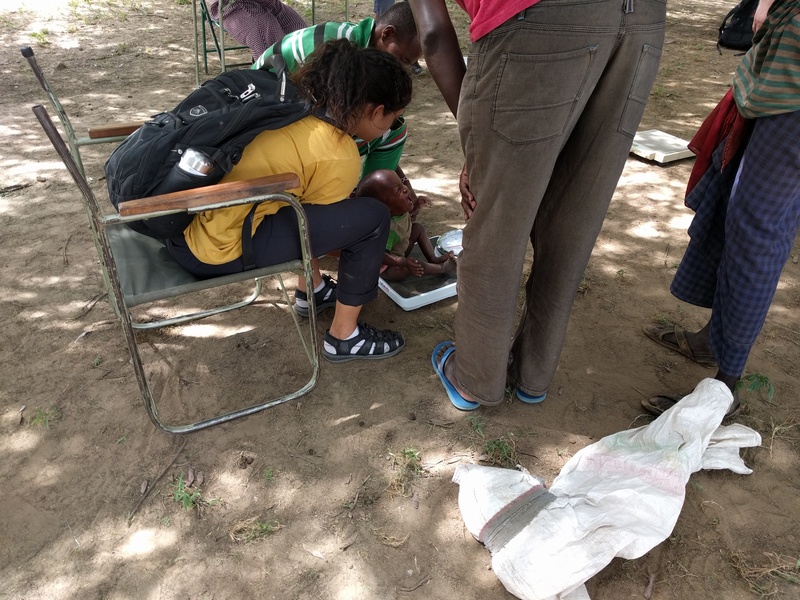 Emily Aviles helps with weighing children to ensure they are a healthy weight. After lunch the students were hard at work writing out final reports. But they still found time for some fun activates. Many bonded over the music from the movie The Greatest Showman while some adventurous students showed off their climbing abilities. On Tuesday students were given the opportunity to go anywhere in the community to gather information for final projects. Sam van der Poel spent much of the morning at the Primary School talking to Shem about the PV array systems the school has in place, while the rest of the students went to a riverbed. Emily Aviles’s project focuses on water data collection so she spent a lot of time asking question to young girls at the riverbed. Konnie Xu and Winnie Wang focused their questioning to the topic of women in education. Before making our way back, we stopped at another hand pump. This hand pump has been abandoned because the water is extremely salty despite its clear appearance. 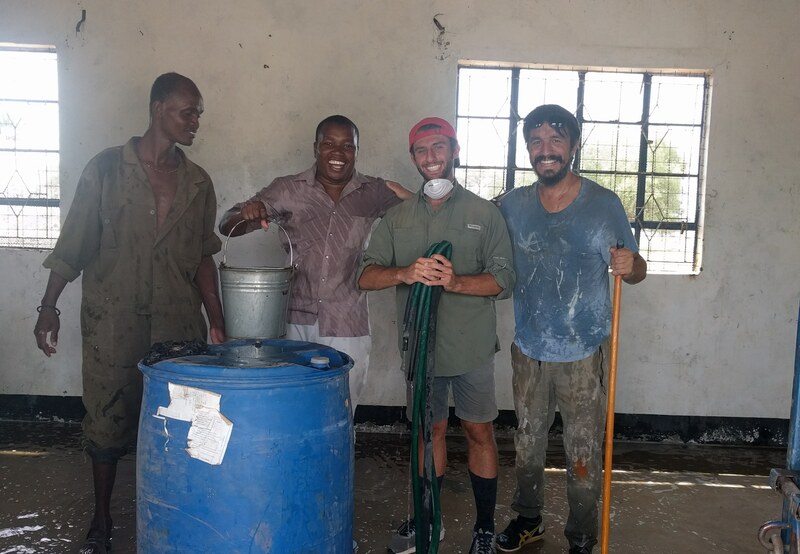 While the student were spending time gathering data the professor and teaching assistant, Rodrigo Peña and Joe Kocaj, were stationed at the clinic to finish the bat infestation removal project. This day was focused on clearing the second room and removing the ceiling to ensure bats do not have a dark place to hide. It was immediately evident that many bats had already cleared the building, as half of the ceiling had already been taken down in the other room. 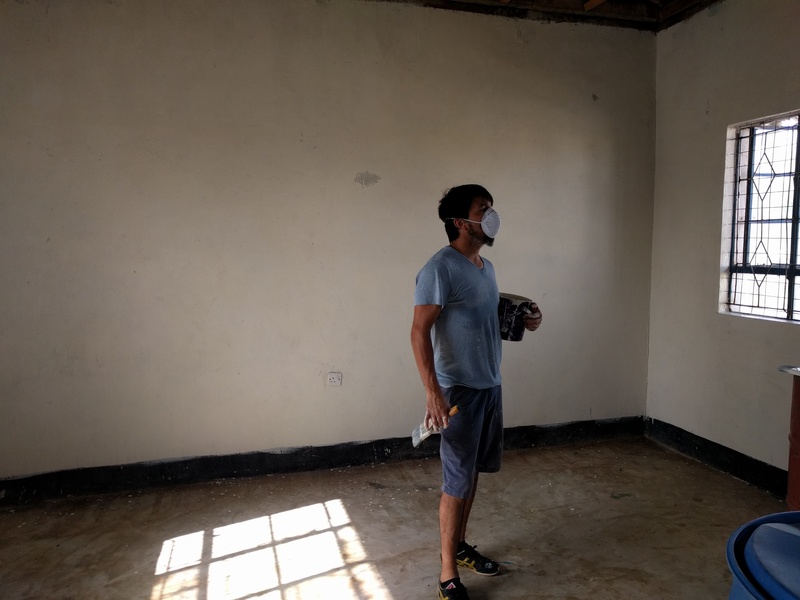 Rodrigo Peña removing the ceiling of a bat infested room. In the afternoon, a few students stayed back to work on their reports while Winnie Wang and Natalie Lubaszka made their way back to the school. Natalie, with the help of one of the teachers and Raphael, had planned a presentation for the upper level girls. With the goal of inspiring them, the presentation was about a Kenyan woman who had forged her own path. Natalie asked the girls about their dreams and found out that they had never been asked that before. Meanwhile Winne went on a fact-finding mission as she spoke to the school principal, Hildegard, about school programs, student pregnancies, and cultural conflicts. Also in the afternoon Konnie Xu spent some time with Habara as they spoke with several people throughout the community. After returning from the school, a surprise was waiting for Emily in the truck. Emily had been trying to find a local, Jack, to speak with. Jack speaks English well and is the father of two girls; both of which he sends to school. His unique views and common tongue make him a great person to spark up a conversation with. Jack hitched a ride back to TBI and answered some of Emily’s questions for her project. On Wednesday we all went back to the school with a large project on our hands. The night before we discussed a way to give back to the students and decided to create a yearbook for them. Going from class to class, we took photos, took down names and asked each student what their dream is. It took the entire morning but we are confident the effort will be worth it! 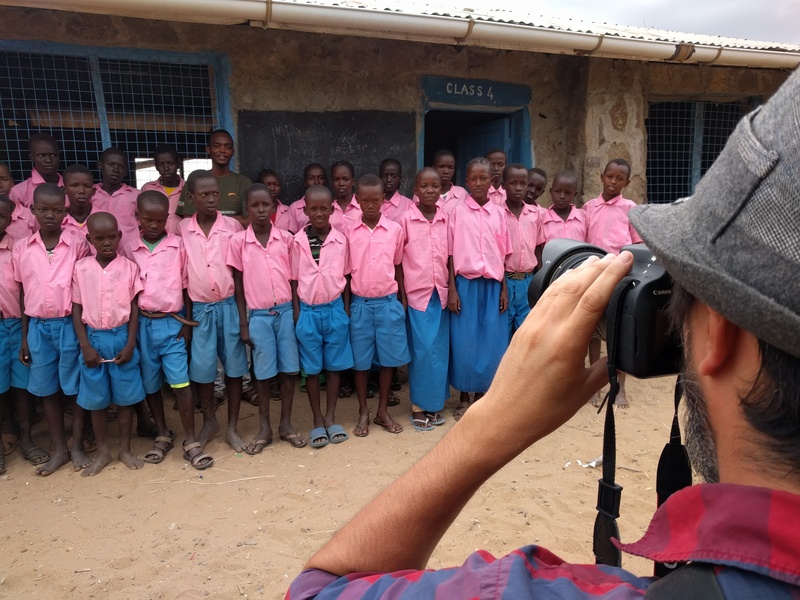 Rodrigo Peña taking a class photo of students attending Ileret’s primary school. After lunch the students worked on final reports and presentations for the rest of the evening. Several of the students even stayed up through the night to finish them by the due date on Thursday afternoon. Thursday while students made final touches on their final projects Rodrigo Peña and Joseph Kocaj finished the bat infestation removal project. This included cleaning the room and painting the walls. 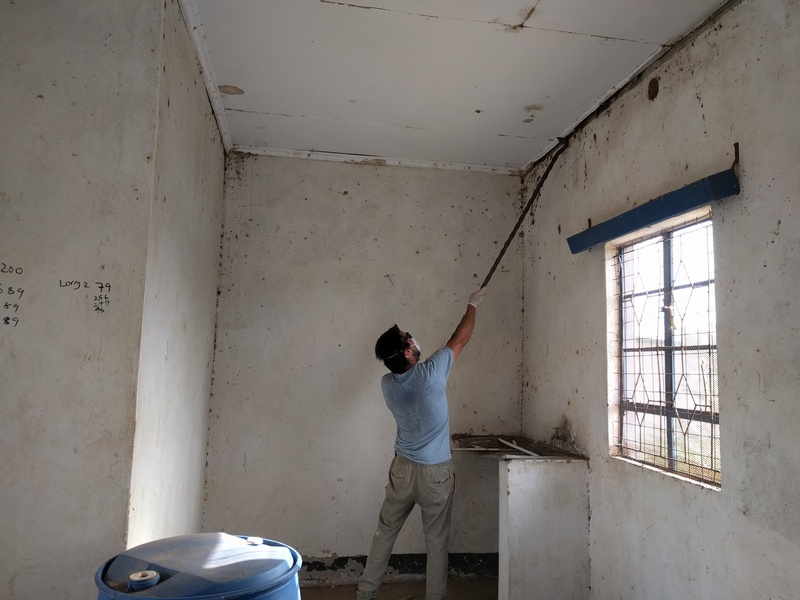 Timothy (left) and Rodrigo Peña (right) clean the previously infested room. 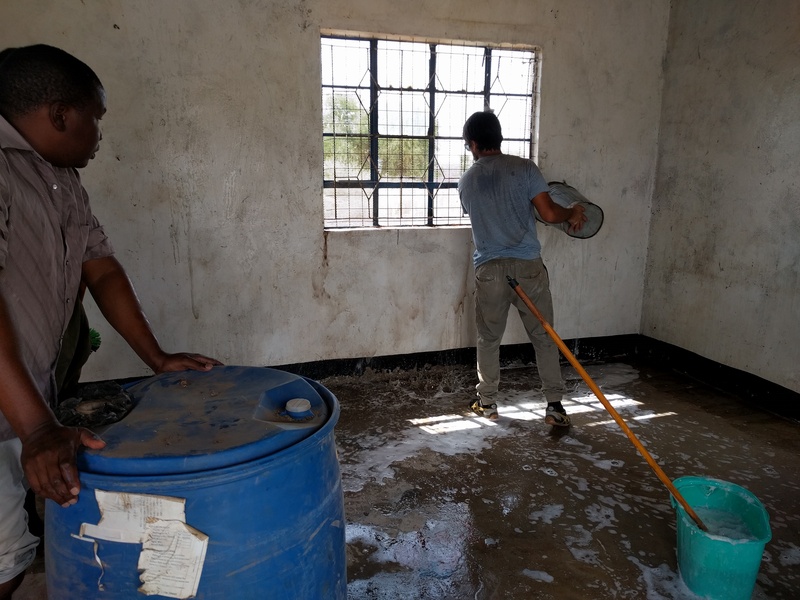 A Turkana Basin Institute staff member, Timothy, Joseph Kocaj, and Rodrigo Peña (left to right) after cleaning the room. 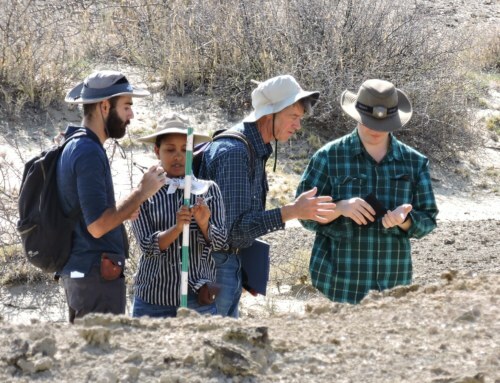 Thursday afternoon the students submitted their reports and presented two weeks of rigorous data collection and hard work, the report topics can be seen in this previous blog post. These reports and presentations set great foundations for future work! However, it will be up to the students to push their ideas forward upon returning home. Thursday afternoon we visited Ileret’s primary school one last time for a quick game of soccer and to say goodbye to our many friends. That evening we celebrated a successful trip and enjoyed our last night in Ileret. 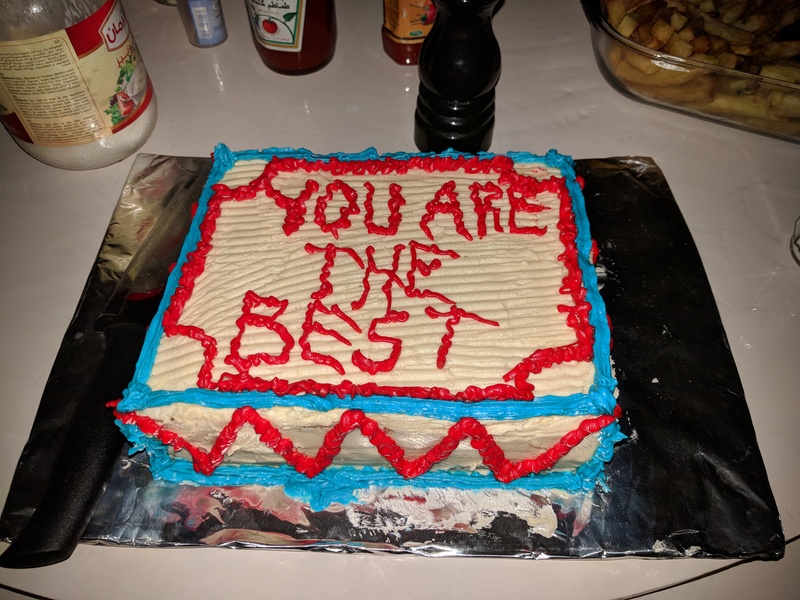 A cake prepared by Turkana Basin Institute’s cook, Edwin. Friday morning we said our goodbyes to our friends at TBI. The staff helped so much with all of our projects and crazy ideas. 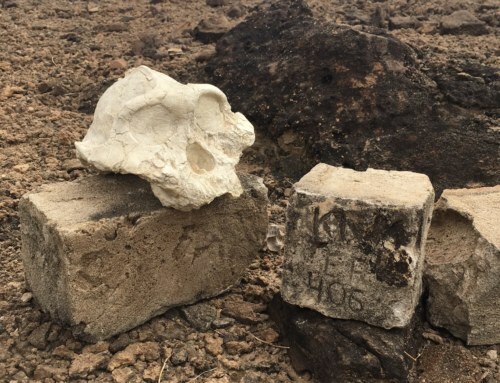 None of this would have been possible without them and we cannot put our gratitude into words for everything TBI and the community of Ileret has done for us. 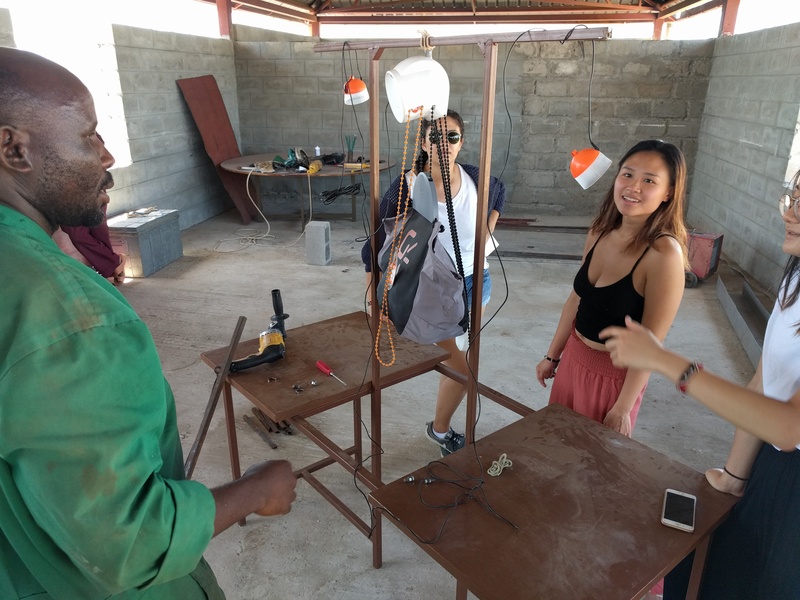 We did not leave without one last lesson from Mwang’Ombe who showed us a gravity powered light which will be supplied to students in Ileret for the purpose of studying at night. Mwang’Ombe explaining the mechanics of a gravity powered light. 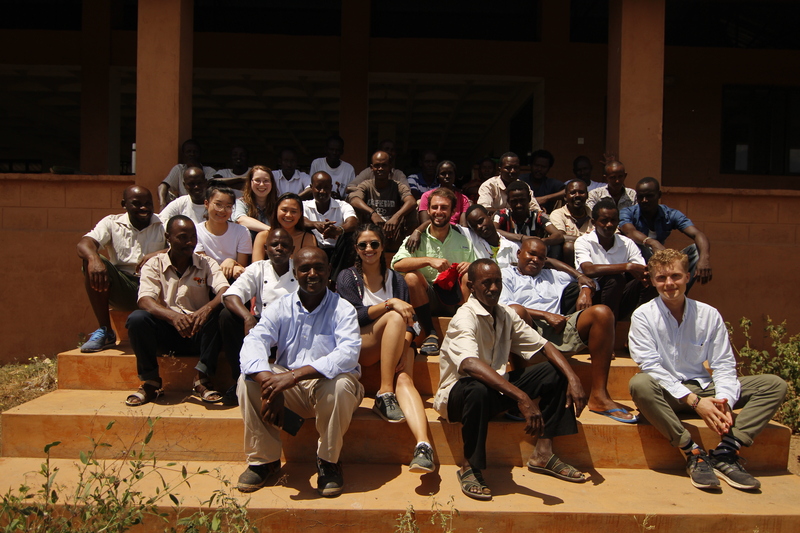 Group photo of the TBI staff and Global Innovation crew. Hi! 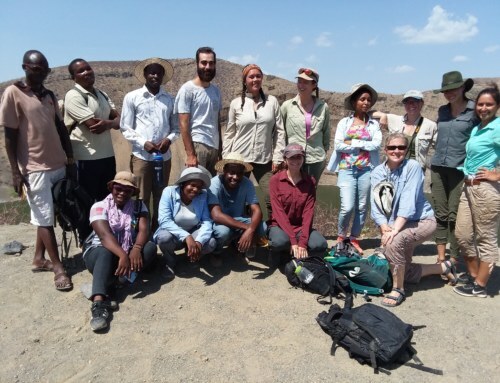 I am Joseph Kocaj, the Teaching Assistant to the 2018 Global Innovation Field School. 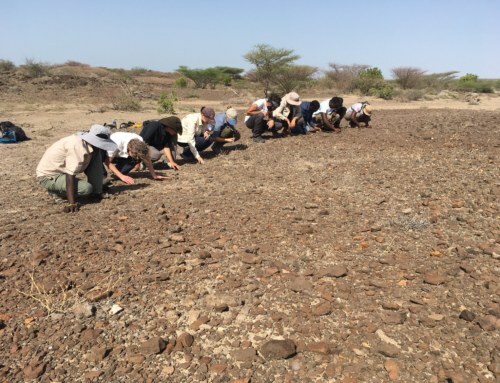 As an alumni of the 2017 Global Innovation Field School I will do my best to aid this year's students in finding sustainable solutions for our friends here in Ileret, the Daasanach. I could not be more excited to be back with the ever-inspiring professor, Rodrigo Peña, and five new faces. 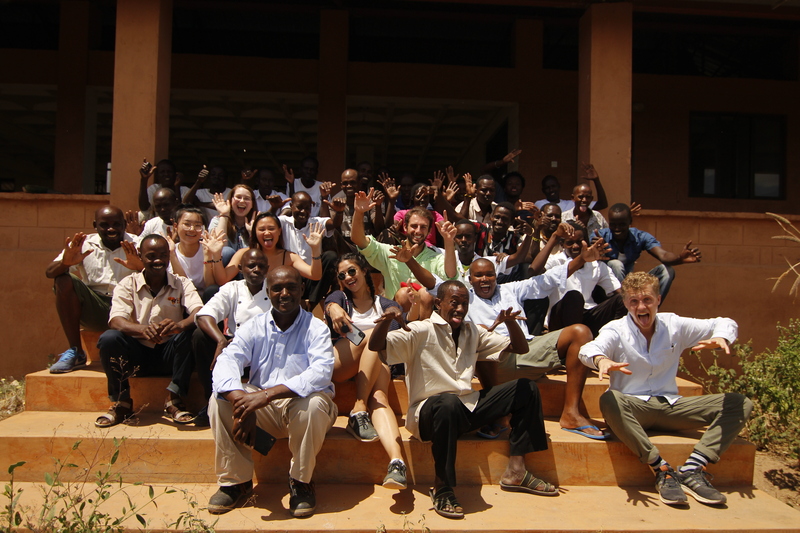 My work improving communities through engineering based methodologies began when I co-founded CentriSeed Innovations, an organization which juggles developing students and communities much like the Global Innovation Field School. 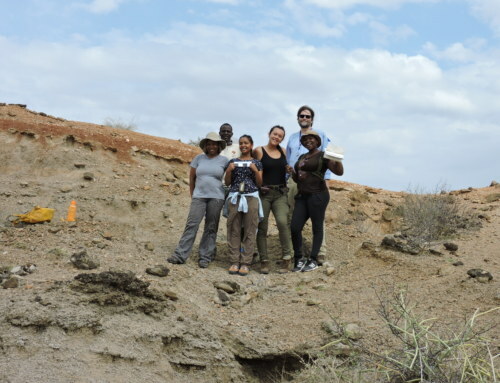 I recently graduated from Stony Brook University and will be working under H2M architects + engineers as a Water Engineer after my stay in Kenya! I am truly excited to work with the year's students and hope to teach them as much as I know they will teach me.